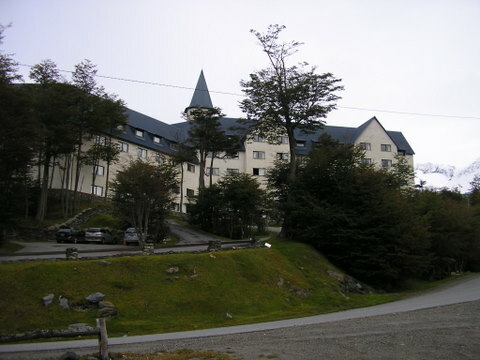 If you do not mind a 4 mile one-way walk up hill from Ushuaia to the chair lift on Cerro Martial, it is a pleasant journey that is not strenuous due to the well paved and quiet road that ascends the mountain. 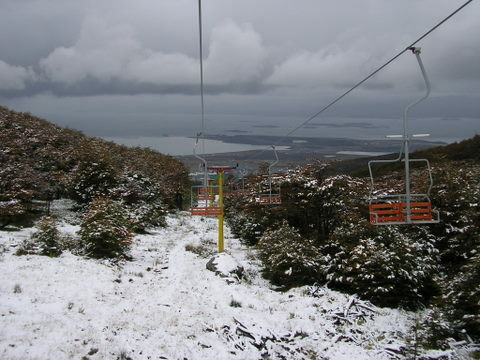 (Of course you can, and most do, take a taxi to the chairlift and that will cost you no more than AR$25 = US$7.00.) On your way out of town you walk through residential neighborhoods. Not that it’s that much different - it’s still a disorganized jumble of houses, from prosperous to makeshift, with a variety of businesses. My favorite was a traditional butcher shop with six full carcasses of beef and lamb hanging in the window! Unfortunately, I was told that some homes in this western area of town were built on very unstable land and may not survive. Once the city is behind you, the vistas, the silence and the forest become prevalent. Bends in the road and spaces through the forest provide panoramic views of the Channel and surrounding mountains. Large log homes are spaciously interspersed with several luxury hotels, but mainly the view is of nature and the looming snow covered Andean peaks. Chez Manu, one of Ushuaia most respected restaurants, is on the mountain road with a spectacular view from its dining room. Owned and operated by French born and educated Chef Emmanuel Herbin, the restaurant has been recommended by many locals. Unfortunately it was closed for lunch when I wanted to dine there so I can not give my personal evaluation. At the chair lift site there are two options if you would like to have a snack or lunch. The Café de Te, part of the Cumbres del Martial luxury cabin complex, is a charming alpine tea room with a spectacular view. I’ve been told that the Refugio de Montana just across the street serves a good Fuegian lamb stew. The chair lift itself is a pleasant adventure. A ticket for a foreign visitor is AR$35 round trip (US$9.60). (Argentina, like many European countries, charge on a scale for non-residents, citizens of the country and residents of the province.) The ten-minute ride provides a silent aerial perspective to the changes in environment in an alpine setting. 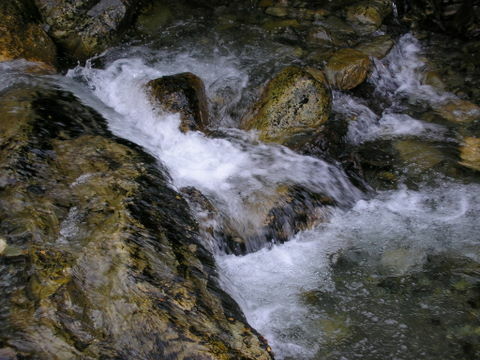 The crystal clear water cascading down the ravine proves that glacier water is truly pure. The trees diminish in size as snow becomes evident on this early Autumn day. On reaching the upper platform, a modest hike through the tree line to the glacier is a humbling experience as the sheer size of the youthful Andes, covered in white snow, surrounds you with silence. The last hundred yards of trees are Japanese-like bonsai versions of their lower altitude relatives and, as if nature placed a red light at that point, they suddenly stop. Then it’s snow and rock walls. It’s exhilarating!